Raichle boots — worth re-soling? I have a nice pair of Raichle boots. The uppers fit perfectly, but the soles were always very slippery and I wouldn’t have bought another pair. I’ve not worn them for prolly 8 years or so, since I stopped wearing leather boots. I bought them because they were just stiff enough to take a crampon. I wore them today, though, because I’m currently without decent footwear. My Inov-8s have given up the ghost and the little Salomon trail shoes I’ve been wearing recently for walking from home don’t really do the job on soaking wet days in sopping wet fields full of cow poo/on slippery surfaces. I’ve Googled boot repair, because the uppers were so very comfy. My feet aren’t quite the same size, but both feet were cozy today with no toe bashing/need to crumple up the toes of my slightly longer right foot. Nor were either of my feet swishing around in too large a space. Everything felt very secure. It sounds from what I’ve read as though re-soling often isn’t successful, resulting in an upper that no longer fits well. Has anyone had a good experience? If so, can you recommend a repairer? Alternatively, can somebody please suggest a nice, light, ideally non-leather and non-membranous boot? I did have a look at Salomon boots online this morning (in the past Salomons have seemed to fit my feet well), but they all seem to have a Gore-tex membrane, which I’ve never really felt was a very good idea. More Googling seems to suggest that maybe Raichle no longer make boots. I’d like something grippy, if at all possible. The sort of thing I can wear for walking Piglet on wet, slippery wintery days in low-lying fields, but can also wear with confidence up in the Lakes or over in the Dales. This entry was posted on Sunday, November 1st, 2015 at 6:07 pm and is filed under Uncategorized. You can follow any responses to this entry through the RSS 2.0 feed. You can leave a response, or trackback from your own site. 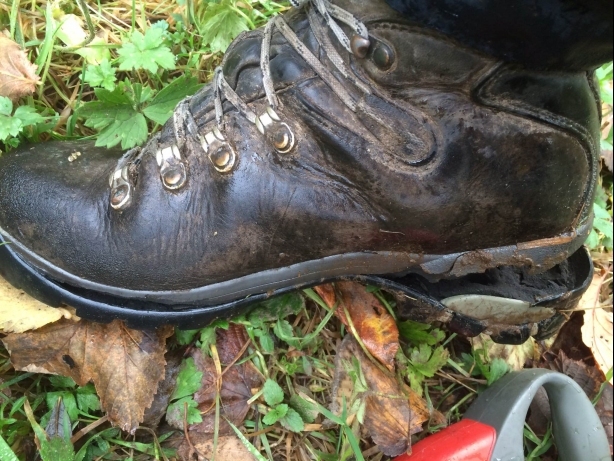 2 Responses to Raichle boots — worth re-soling? They seem to be the main repair people for Asolo amongst other brands. They seem to do a good job. As it happens my fey feet seem to rub the heel out of approach shoes. Not sure why, but what I do now is pop along to the LSR ‘seconds room’ and get a cheap pair for around £30. Beats forking out for expensive new kit that is likely to get the heel rubbed out. In fairness, someone has recommended I try Superfeet (again, I used them many years ago) to ensure a better fit and avoid rubbing the inside of the heel out. When I get around to that….